With its dramatic color and creamy cloud of whipped topping, our Easy Holiday Ribbon Bowl looks fantastic on a dessert buffet. Add 3/4 cup boiling water to lime gelatin mix in medium bowl; stir 2 min. until completely dissolved. Add ice; stir until gelatin is slightly thickened. Remove any unmelted ice. Pour gelatin into 1- to 1-1/2-qt. bowl. Refrigerate 15 min. or until set but not firm. Add remaining boiling water to strawberry gelatin mix in large bowl; stir 2 min. until completely dissolved. Add 2/3 of the COOL WHIP; stir with whisk until COOL WHIP is melted and mixture is blended. Refrigerate remaining COOL WHIP for later use. Carefully spoon strawberry gelatin mixture over lime layer. Refrigerate 2 hours or until set. Top with remaining COOL WHIP just before serving. Serve this simple festive dessert at your next holiday celebration with loved ones. No need to thaw the COOL WHIP. By using frozen COOL WHIP, the dessert magically layers right before your eyes. Divide frozen COOL WHIP into thirds in tub using small knife. 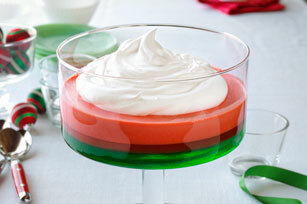 Remove 2/3 of the COOL WHIP with spoon and add to dissolved gelatin as directed. Experience a different flavor each time - just by changing the flavor of JELL-O.